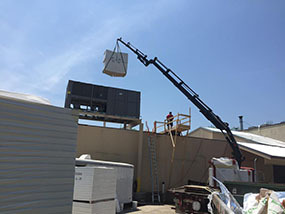 If you need a roof installed or replaced on your commercial building, The Roof Coating Company offers several types of single-ply roofing systems that are durable, low-maintenance and cost-effective. Meanwhile, if you already have a single-ply roofing system but it needs to be inspected, repaired, or restored, we’re ready to help. Clients in Hampton, VA can reach us at (757) 244-2305 for a free onsite roof evaluation. We’re a quality-driven company that will always go the extra mile to ensure clients get the absolute best roofing solutions. We have decades of industry experience and are known for our “green” roofing systems that will keep your building watertight while simultaneously saving you money on energy costs. The Roof Coating Company offers premier customer service, free estimates, and high-quality craftsmanship. 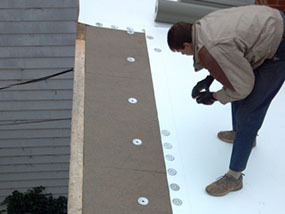 An EPDM roof is one of the most common types of single-ply roofing. EPDM is cheap, durable, and low-maintenance. With just a few services here and there, this type of roofing system can last over 40 years. The material is fully-recyclable and compatible with roof coatings should you choose to restore it as the years go by. A Thermoplastic Olefin membrane comes in white which makes it extremely effective at reflecting sun rays. If increasing the energy-efficiency of your building is a priority, this is the single-ply roofing system for you. TPO roofs continue to grow in popularity. They’re long-lasting and resistant to chemicals, punctures, and more. Available in a range of thicknesses to suit your building, a PVC single-ply roofing system will have your roof watertight for decades. The Polyvinyl Chloride material is quite flexible, making it a great option for uneven surfaces. There are also a variety of color options to choose from. The Roof Coating Company has built up a solid reputation among clients in Hampton, VA. We’re the go-to commercial roofing company for those in need of single-ply roofing services and more! Our company is dedicated to getting clients the end results that they were hoping for. To learn more about our services, give us a call today at (757) 244-2305.